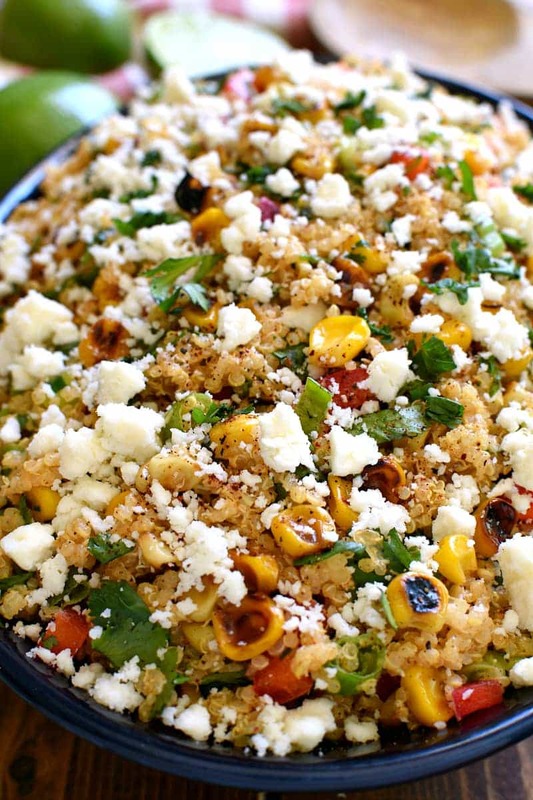 Mexican Street Corn Quinoa is a great way to jazz up a quinoa side dish! 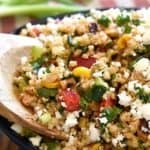 Loaded with the delicious flavors of Mexican Street Corn, this quinoa salad recipe is fresh, flavorful, and perfect for summer! So I mentioned back in February that we’re in the process of planning a kitchen renovation. And now, suddenly, it’s right around the corner. And I’m nowhere near ready for it! Because blogging and no kitchen don’t exactly go well together….and that reality is just now sinking in. It’s funny how you can talk yourself into anything that’s really far away. Because it doesn’t actually feel real! Not until you get the phone call, letting you know that the renovation date has been set for two weeks, and suddenly you freak out because you thought you had so much more time….! Yep, that’s exactly where I’m at. May 8th is the date! So I guess what that means is it’s time to buckle down. In a serious way. Time to take a long, hard look at my to-do list and start checking things off. Starting with all things blog related. Because there are certain things I need to get done and certain things I want to get done, and I want to get it ALL done before demolition begins. This Mexican Street Corn Quinoa falls somewhere in the want/need category because I literally haven’t been able to stop thinking about it since I dreamed it up the other day. Which clearly means I’ve been needing to make it, right? I love quinoa in all shapes and sizes, like Southwest Quinoa Salad and Red, White & Blue Berry Quinoa Salad and Sweet Potato Kale Quinoa. And as soon as I made this Mexican Street Corn Quinoa I knew it was exactly the right way to be spending my time. 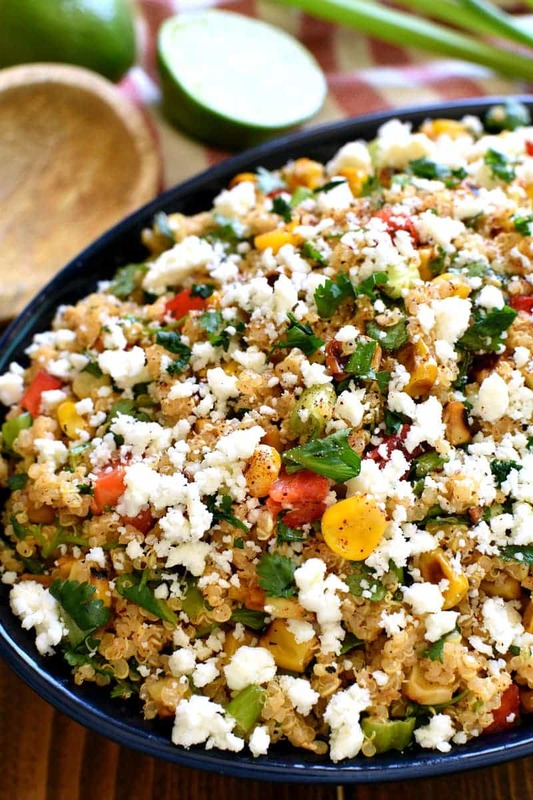 Because this quinoa salad is loaded with all the flavors of Mexican Street Corn, it’s pretty much amazing. Perfect as a side dish for summer cookouts…or as a main dish if you’re looking for something on the lighter side. And even though my to-do list hasn’t gotten any shorter, I somehow feel better knowing that I can put a big checkmark next to Mexican Street Corn Quinoa. And now I can just enjoy it…..all. summer. long. Looking to mix up your salad routine? 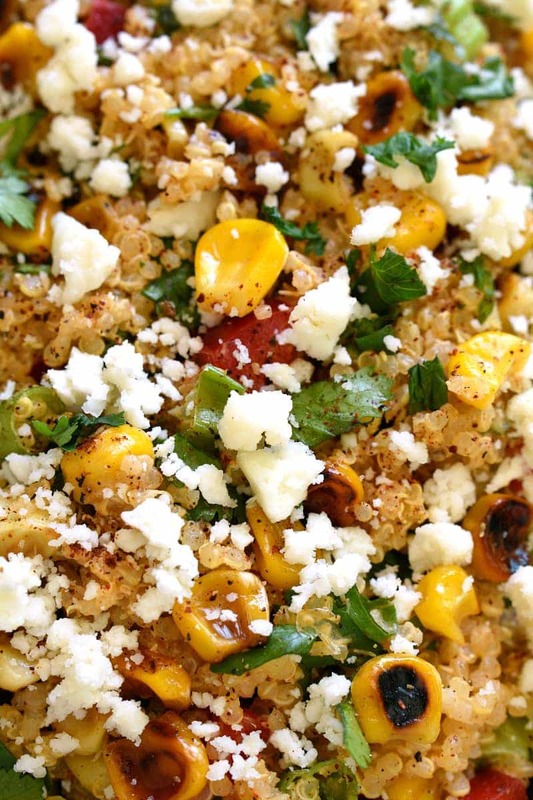 This Mexican Street Corn Quinoa is for you! 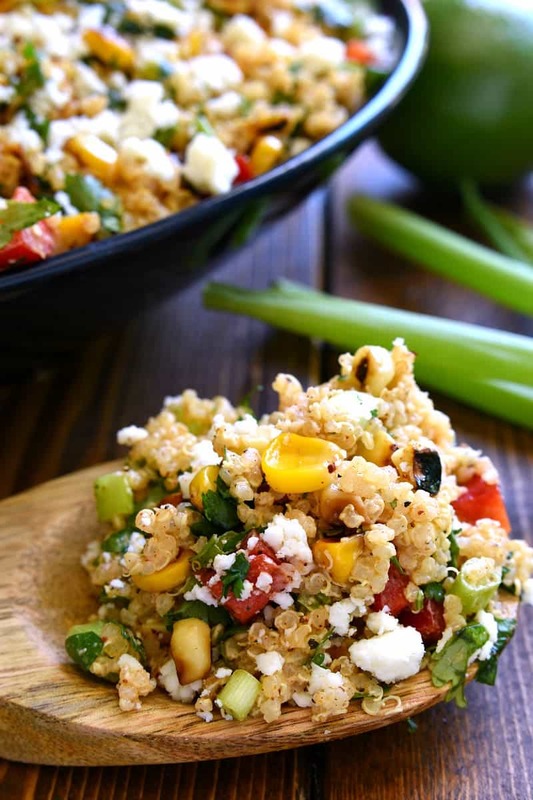 Loaded with all the delicious flavors of Mexican Street Corn, this quinoa salad is fresh, flavorful, and perfect for summer! 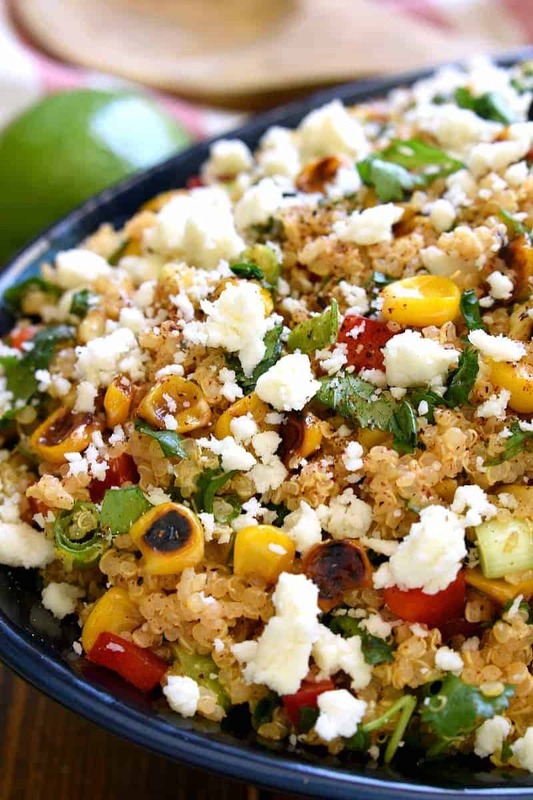 In a medium mixing bowl, combine cooked quinoa, grilled corn, cilantro, red pepper, sliced onions, and crumbled cheese. In a separate bowl, combine sour cream, mayo, lime juice, and seasonings. Mix well. Pour sour cream mixture over quinoa mixture and stir to combine. Garnish with additional crumbled cheese and cilantro, as desired. This looks so good! I love quinoa, and anything with mexican flavors. All the flavors and textures in this quinoa have me swooning. It’s the perfect scoop of summer! I love this idea! Such a great dish for the summertime. Love the flavors in this dish! Mexican Street Corn is packed with flavor, so I know this dish will be too! Such an amazing dish! Perfect for summer!! I would love to have this for lunch tomorrow! Just look at all those colors! I bet this is such an amazing dish for summer! This is such a great recipe for cinco de mayo! I’m crazy about mexican street corn, it’s so good! I know we’re going to love this! On my favorite flavors combined into one! This looks perfect And delicious! 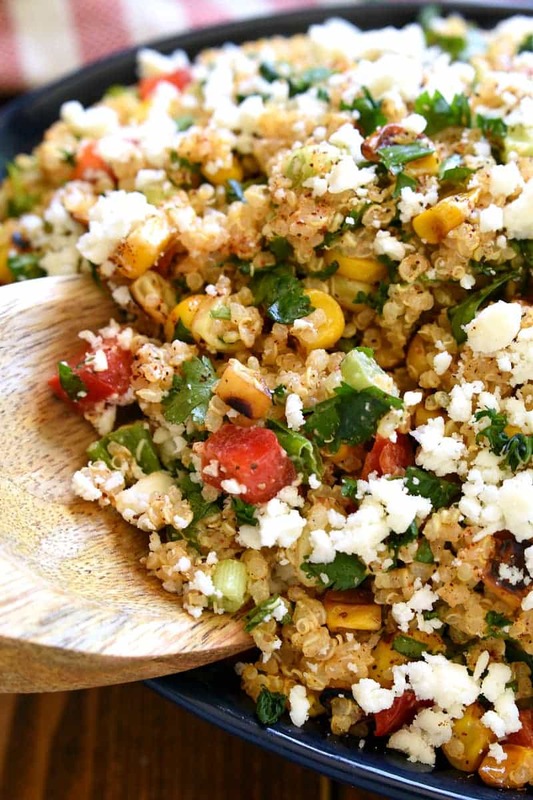 I love quinoa and this recipe seem so mouth-watering! Great dish! Yes! I need this for dinner asap! Made this for dinner tonight, to go with a pork tenderloin. Absolutely delicious! I will be making this again. Thanks for sharing. Ok, so you eat this cold? Raw red pepper?